Date night did involve The Usual. Unlike when we took the Pates there a few weeks ago, it was its perfectly normal wonderful chill bar. I discovered a new drink too, The Ambassador’s Punch! Yumm-o. So Natalie had one of the worst weekends ever. It’s right behind how bad things were around Christmas (except she had no excuse of being sick this time!). She’s really testing us to see what she can get away with and as Zach says, she’s “really coming into her own”. It’s like some demon came in and picked up our wonderful, loving, sweet baby girl, and switched her with this physically abusive (hitting/biting), hollaring, kicking, defiant tantruming tyrant! Thankfully she had a great two days back at daycare though and seems to be back to her sweet self. Then like that, she’s back to her wonderful self! I can’t emphasize how much I love this little girl. She’s the most wonderful thing that has ever happened to us, but I’m just in awe of how quickly she can transition from this kind, considerate little being to a tornado hitting, screaming, destroying everything that comes near her path. I mean she kisses and hugs on us, her Doll Doll, the cats (especially Cypher), Helo, and other random objects that come in her path. Who kisses the coffee table or chairs? She’s so funny. 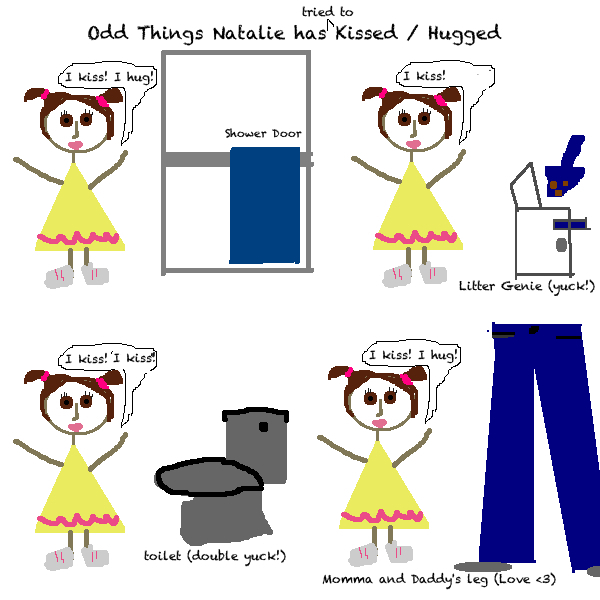 Speaking of crazy things she’s kissed/hugged I made this little picture to show the weirdest things she (tried) to kiss/hug this past week. This entry was posted in heart Natalie, heart Zach. So my apparent whining of weekly date nights from ages ago didn’t fall on deaf ears. After a wonderful lunch at Abuelos (<3) Zach suggested we go out tonight. See we were supposed to take Natalie to the drive in to see Mr. Peabody and Sherman/The Lego Movie but someone was a super fussy pants yesterday so we decided we couldn’t go. I suggested we go tonight since Natalie’s had a really wonderful day (only one time out! and even got desert at lunch for being so good at the restaurant) but it’s now pouring rain. So then comes the inevitable “What do you want to do?” discussion, which is almost as bad (maybe worse) than the “where do you want to go for dinner?” question. I teased dance club. (Zach and I had a conversation about what kind of music will define this generation (as obv. grunge/alt. defined ours) and he said the lack of guitars and major synth/keyboards (which I love) and said it’s basically disco.) You know, since the alternative music we listen to is basically disco according to him. So he’s looking up dance clubs… and came up with Billy Bobs. Ha. I bet tonight will involve a trip to The Usual. I’m not as tech savy as I pretend/assume/perceive myself to be and others may think I am. Getting the pictures on this site to view correctly has been a mess. I think finally I may have figured it out and am happy with what it will be. (Omg lightboxes!) Things aren’t as easy as they were almost 10 years ago when I was in college doing tech support. Plus running an almost error free mac for years has made me computer stupid (yes I can admit it). Hopefully will get things going as normal tomorrow? Natalie has been both fabulous this week and was an absolute train wreck the last two days. Amazing what a change in schedule can do. So here we go! After changing the theme about 5 different times and going line by line through the style sheet trying to change colors and fonts, I think we are good to go! Thanks Zach for getting this going for me. This will be a place where I’ll track all the wonderfully strange things going on in our little family with a very sweet, beautiful and active 19 month old.